Houstonians have been waiting with baited breath for the opening of State of Grace, chef Ford Fry’s first restaurant in his native city. Taking up residence in affluent mansion-strewn River Oaks, the dining room is housed in a 1950s brick build, once home to Fry’s childhood confectionary store. Best known for his popular Atlanta eatery, The Optimist, the James Beard Award nominee has paid homage to his southern upbringing with a menu that includes lobster hush puppies, shrimp a la plancha, and duck carnitas. Meanwhile, pastry chef Chrysta Poulos ups the nostalgia stakes with house-made pecan ice cream balls slathered with hot fudge sauce. Interiors, by Fry’s long-time collaborator Elizabeth Ingram, features a colour palette of white, moss green and slate grey against open brickwork walls, walnut and leather banquettes and marble counter tops. 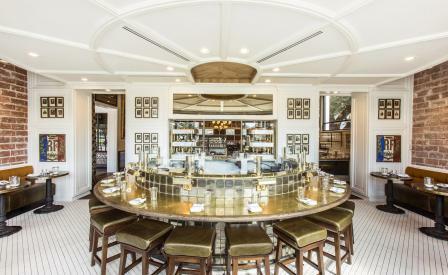 Three custom-designed chandeliers hang from a white oak parquetry ceiling presiding over the focal point of the space; a semi-circular hand-burnished brass counter top showcasing an expansive cold bar and oyster programme. If you’re not here to join the glam crowd chucking back sea wings from the Texan Gulf, pull up a seat in the main dining room where windows frame the sprawling branches of a grand oak tree out front.